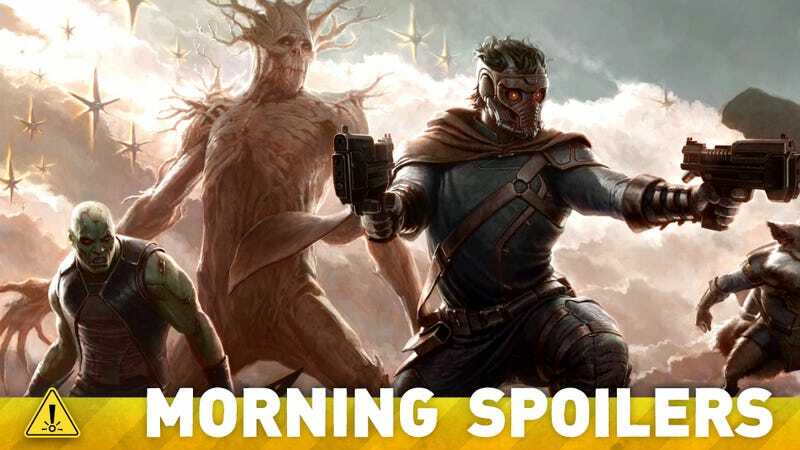 A Pushing Daisies star will be the villain in Guardians of the Galaxy! Shane Black explains why the Mandarin is the "über-terrorist" in Iron Man 3. Dan Aykroyd is excited again about Ghostbusters 3, and this time the Higgs boson is involved. Matthew McConaughey has some more cryptically chill things to say about Interstellar. There's tons of info about the Arrow season finale. Spoiler alert! "If you're going to do something that involves a terrorist in a modern world, who's just sort of a villain, who's just sort of a guy that we're all afraid of, why not say something about the entire experience of what it would take to create a myth that was all things to all people? That drew from elements of traditional historic warfare like swords and dragons - surrounded itself with icons that were recognizable like the beard from Fidel Castro, and the field cap from Gaddafi. "Why not make an über-terrorist, and then play with the idea of that? Have that man's sole unifying characteristic be his undying hatred for America, such that he attracts to him these acolytes and disciples who respond to the myth? We thought that was an interesting idea, regardless of his ethnicity." "Oh, I can tell you a little bit, but even that is sort of under lock and key. It really is. For whatever reason and most of them I understand, they choose to say 'That's our business and how we do it. We don't advertise it.' I spoke to him months ago, not about anything specific, but he, obviously, is a man who makes his own choices from an independent state. I'm glad that he saw something in me that he thinks that I should be the guy... [On Jonathan Nolan's script] I give it a thumbs up... The prep, I'm not telling you anymore. You're doing good though. A lot of people are [excited]. I'm not saying anything." Director Edgar Wright and actors Simon Pegg and Nick Frost reunite for a third film following the successes of "Shaun of the Dead" (2004) and "Hot Fuzz" (2007). In "The World's End," 20 years after attempting an epic pub crawl, five childhood friends reunite when one of them becomes hellbent on trying the drinking marathon again. They are convinced to stage an encore by Gary King (Simon Pegg), a 40-year-old man trapped at the cigarette end of his teens, who drags his reluctant pals to their hometown and once again attempts to reach the fabled pub – The World's End. As they attempt to reconcile the past and present, they realize the real struggle is for the future, not just theirs but humankind's. Reaching The World's End is the least of their worries. I feel re-encouraged, reinvigorated by the pages that I have seen. I know that we're expecting half of the screenplay to be completed very soon. It should be into production by the fall and be shooting by the new year. I won't say anything, it's very exciting. The Higgs boson and the particle theories, gluons and mesons, that really gives us a scientific base in terms of our fictional storytelling, to open up to another dimension and have something horrible come through. We're going to really put it into ninth gear, in this third one. It's going to be very, very exciting. I've been more encouraged than I ever have been. It sounds real now. We've got a sharp new writer on it, Ivan (Reitman) is on it, Harold (Ramis) is on it, I'm on it. And if I can put the catch-net on Billy [Murray] and bring him in, it will be wonderful, if he decides to do it. There will always be a hole for him. Here's a promo for the next episode, "Journey to the Centre of the TARDIS." Here's the promo for the next episode, "Home." Kitsis: Ariel could potentially be a Season Three. We're definitely going to meet new characters. Kitsis: If you watch the finale, you can probably guess who would be there. This one is written by Robbie Thompson, who wrote the other two, as well. So obviously, you have witty lines and all the pop culture references you could ever want. But this one has a surprising amount of depth. For people who love Charlie, who are interested in her character, there's a lot revealed, a lot of deeper layers that people will encounter in this episode. It's a great journey really. When I spoke to [executive producer] Jeremy Carver, he also said they're peeling back the layers on Charlie. What kind of stuff are they exploring with her past? Rewinding a bit, what brings Charlie back this time? What is she seeking from the Winchesters? Charlie is very proactive in this episode. The other episodes where she worked with the guys have been ones where she was roped in accidentally into this world that she never asked to be a part of. In this instance, she comes to them… She wants to be a part of what they do. I love the fact that rather than [them rejecting] that, she, through circumstances, is taken under Dean's wing and is introduced into the world of being a hunter, which has its up and downs, of course. [Laughs] There are definitely seeds of that. There's a lot of tension to be mined now that there's a rift between Oliver and Tommy. Everyone else who knows Oliver's secret is on board with him and is part of his team, and now you have this "rogue" element. Where Tommy's loyalties lie and how that fits in with Laurel, and his father, all comes to a head at the end of the season. This season has been all about change, how noHome Invasion character is who they were at the start of the season - Tommy more so than anyone. Just how tense will things get between Oliver and Diggle as they disagree over handling the Deadshot situation? It's going to get very tense. It's going to create a big rift between the two friends. This is Dig's new raison d'etre, finding out that the man who killed his brother is out there and still killing. He's hell-bent on getting justice, and that's not always going to jibe with Oliver's mission. There are a lot of rifts in these last few episodes, between many of these main characters. Talk about Roy Harper's journey. Colton Haynes told me he's determined to ally with The Hood. Everyone's been changed by Oliver's return, Roy Harper included. He was a street hustler, somebody who didn't think he would live past his 25th birthday. His goal in these last few episodes is to hook up with the Arrow. He brings Thea on board, and that puts Thea Home Invasionon a collision course with finding out her brother's true identity. I love the season finales, and the end of seasons in general, that tie everything off, and you go ‘Wow! Where is it gonna go'? And just when you think there's nothing, you sprinkle in a few little things. So whether it's Diggle's involvement with a certain organization that we're seeing over the next couple of episodes, or me confronting Roy with Thea right there in a particular scene, while we are servicing a lot of our storylines for Season 1, you do start to see little Easter eggs along the way for Season 2. Might there be a chance that not everyone will make it out alive? Well, you have found out during the course of the series, and what's been already said somewhat. His wife was murdered in the Glades, and his family were very instrumental in the beginning, along with the Queen family who tried to rebuild the city, but when his wife was murdered, he lost, through the grief…this is my underlying stuff, but for him, he lost his focus. Consequently, he went off and wandered into the east, and ended up on an island called Nanda Parbat, and this is what's being explained in the finale of where he trained, how he trained and why he became the Dark Archer. So it's all based around love. It's all based around loss, grief, his kind of drive. But his drive of his power and his wealth were the only ways in which he could subsidize and control and help pay for his plan and his big kind of Svengali outlook on what he's going to do to the city. So therefore his drive to be successful was huge, and that's why when Tommy, his son, who's a little bit lazy and a party boy, he gets pissed off about it. I think deep down inside, if he knew who Oliver really was, he really would want Oliver as the son. Here's a sneak peek at the next episode, "The Originals." Here's a promo for the next episode, "The Devil in the Dark." Here's a promo for season three. Kiera investigates a new street drug she recognizes from her future while Sonya and Travis go to war using gangs as their weapons. Here's an introduction from executive producers Sheri Cooper and Jennifer Levin for the next episode, "Playing With Fire."